"The pearly beige Island, shimmering bronze Delight and vibrant orange Holiday". I've already reviewed Holiday (here), totally passed on Island and must confess that I wasn't convinced about Delight either. But curiosity got the best of me. Like the matte version as well. 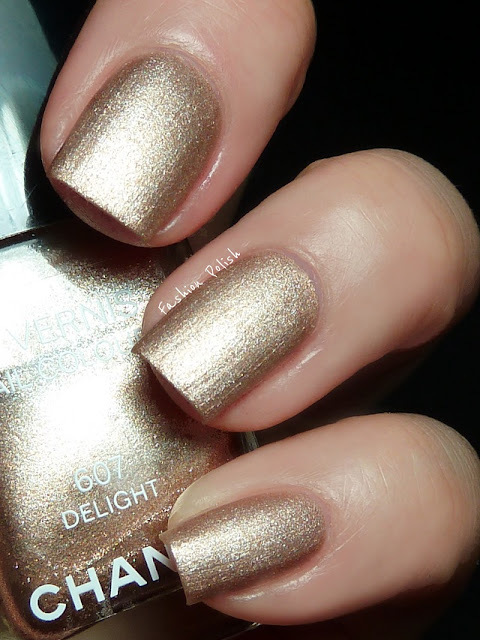 Not crazy about this one as-is, but the matte version looks like a beautiful, golden beach! A neon, glitter, or holo from these guys would be so amazing. I love both vesrions very much! Love it! I don't know, Sam; I think it looks lovely on you, both versions. As to Chanel and neon, I don't know if I can see that happening anytime soon, but you never know, right?! But glitters...ahhhh, I have some oldies of theirs that are still relevant today and just gorgeous in their own right -- will be posting my swatches ... eventually! 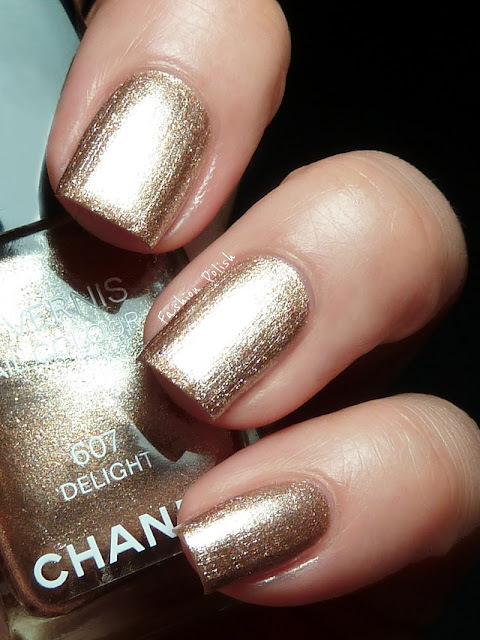 I am not a fan of gold polishes and to be honest this one doesn't look too special to pay so much money for it. The matte version is so pretty! i love this color!!! its the only one i bought from the collection! i think it looks awesome on you! This is a gorgeous color but I agree it looks better matte. Oooo, the matte velvet version ROCKS! What do u think the difference is between that one and a regular matte top coat? love this. saw it today and was undecided whether to buy it or not...i'll be getting it.